Thousands of cheering people lined Pierre streets on June 15, 1927, to watch President Calvin Coolidge’s motorcade pass by. Seth Tupper of Rapid City will discuss the president’s historic visit to South Dakota when the History and Heritage Book Club meets at 7 p.m. CDT on Tuesday, March 13, at the Cultural Heritage Center in Pierre. Tupper is the author of “Calvin Coolidge in the Black Hills.” His presentation will focus mainly on the president’s time in the Black Hills but will include a few humorous stories about the stopover Coolidge made in Pierre during his train trip to the Black Hills. “There was a national spotlight shown on South Dakota during the nearly three months President Coolidge spent in the Black Hills. His visit kick-started the carving of Mount Rushmore, and it was in Rapid City that he shocked the nation with his announcement that he would not seek re-election in 1928,” said Catherine Forsch, president of the South Dakota Historical Society Foundation. The foundation is the nonprofit fundraising partner of the South Dakota State Historical Society and the sponsor of the History and Heritage Book Club. Tupper graduated from South Dakota State University in Brookings with a bachelor’s degree in journalism. He is currently a reporter for the Rapid City Journal. A nine-car train bearing approximately 80 people, including President Coolidge and First Lady Grace Coolidge, plus the Coolidges’ two collie dogs and pet raccoon, pulled into Rapid City on June 15, 1927. The presidential train arrived back in Washington, D.C. on Sept. 11, 1927. Coolidge’s adventure in the state included fishing, attending his first-ever rodeo and meeting with American Indians. Coolidge signed legislation granting national monument status to the Badlands on his last day in office on March 4, 1929. 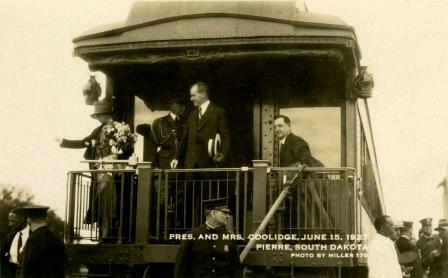 “On a personal level, Coolidge revealed a side of himself to South Dakotans that few others ever saw. As one of Coolidge’s aides wrote that summer, ‘It seems to me that for the first time in his life he is actually playing,’” Tupper said. “Calvin Coolidge in the Black Hills” is available at the Heritage Stores at the Cultural Heritage Center and the Capitol and online at www.sdhsf.org.